There's more to this game than red turtle shells and banana peels. We're all about cool projectiles that we can chuck at opponents, and the fire flower gives us all the firepower we need. This items gives you the ability to hurl fireballs (if you go past three at the same time, the first fireball you threw disappears) towards competing racers. You can even bounce them off walls. If you're in first, make sure you hold down on the analog stick to toss a few of these bad boys over your shoulder. While we're a little disappointed that the Super Mario Bros. 3-inspired item doesn't allow you to fly, it does give you the ability to spin 360-degrees to knock other drivers for a loop. 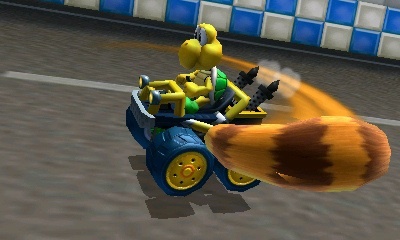 The multi-purpose item can also be used to clear any banana peels in front of your path, and you may want to keep it handy if you have racers with a green, or worse yet, red shell behind you. Time it right and you have nothing to worry about (except those annoying blue shells). Talk about a game-changer. 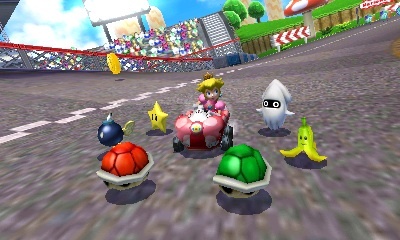 Lucky Seven gives you seven items that circle around your kart, which you can use one after the other. 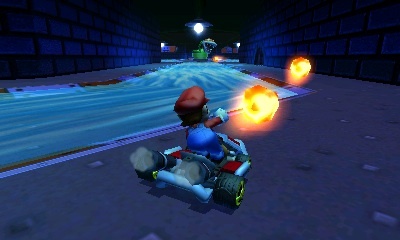 Just make sure you use those items quickly before another racer rams into you (destroying any items they hit). You can follow up that red shell with an invincibility star and then with a lightening bolt, allowing for the largest display of offense we've ever seen in the series. Pretty awesome.